I know the importance of a good night’s sleep. 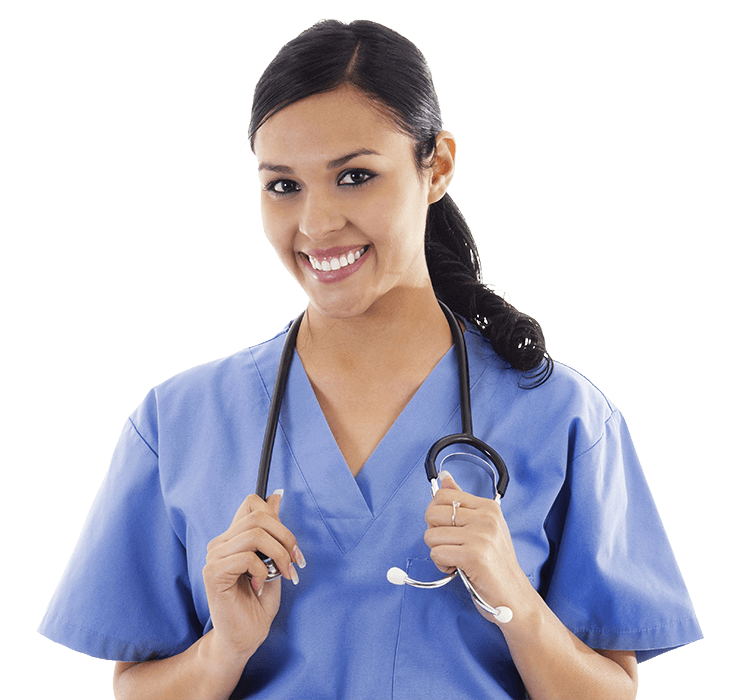 As a nurse, I know the importance of good sleep for my patients. I find this is even more true for me. When it is time for me to sleep I need to know that it will be of the type that re-energizes my body for the next day. Because I know the positive effects that good sleep gives me I want to make sure my bed is one that actually helps me get that type of rest. With my iSleep mattress I get the best sleep in my life! I love the PROPER support the iSleep mattress gives. 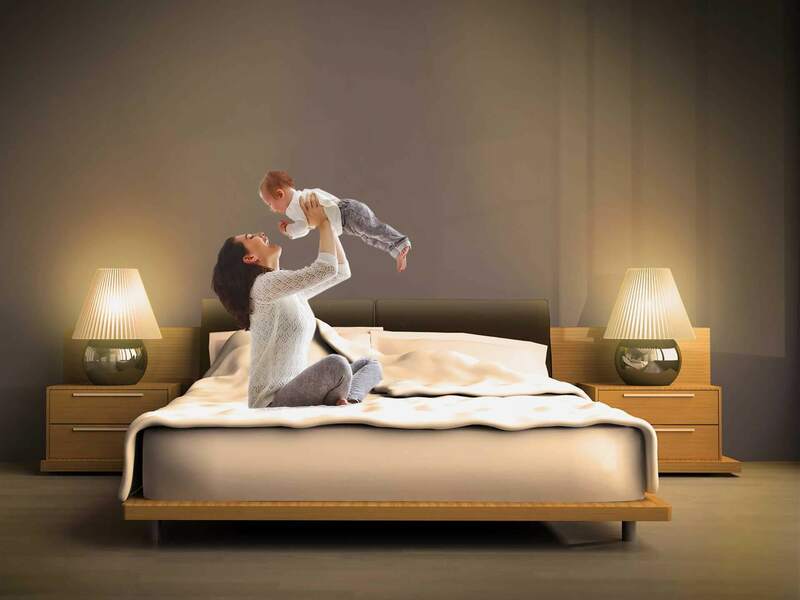 As a chiropractor, I love the consistent and PROPER support the iSleep mattress gives. Myself and my patients love these mattresses. I recommend the iSleep to anyone looking for a new mattress. The iSleep system allows me to be comfortable and supported. I suffer from chronic neck pain and this bed was recommended by my doctor. The iSleep system allows me to be comfortable and supported on a firm setting. My husband prefers his side to be softer. We love that it has the flexibility to make us both happy. We have owned this bed for over 5 years now and I can’t imagine ever buying a different brand!! Rest assured you have found the best airbed. Rated Best Buy in Airbeds. From Amazing to Wonderful with the push of a button! Feels like floating on air, free from pressure, while our patented coils provide the support; solving the inherent problem of other airbeds. Why compromise on comfort or support? Patented coil support technology responds to you individually, adding support when you need it. iSleep makes personalized comfort easy. 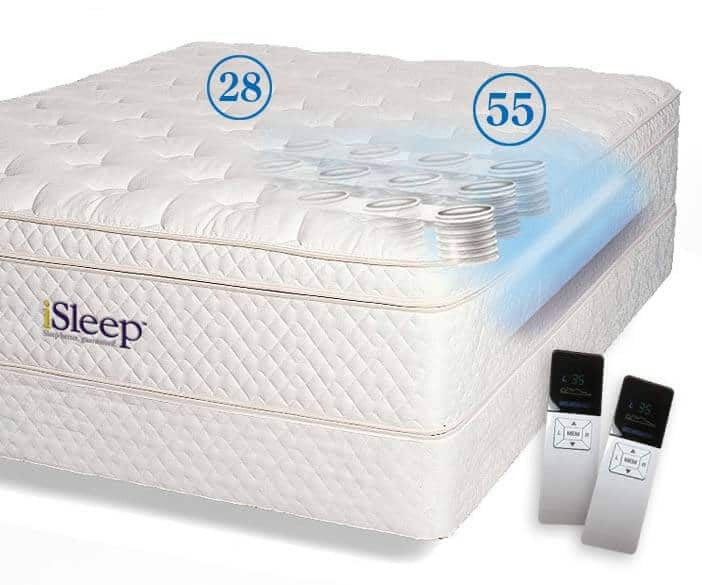 The iSleep features dual air chambers, so each side can be adjusted to your needs. And these adjustments are quick and easy with iSleep’s dual hand held controls. Watch here to learn more. Finding the right mattress can now be done in the privacy and comfort of your own home, not in a high-pressure showroom. Getting to know you and your sleeping preferences is what makes iSleep so successful and our 99% 5 Star customer satisfaction as reported on Goodbed.com. When your new iSleep mattress arrives put it through the same paces you do your current mattress for 100 days. If during this time you really like your new iSleep mattress but believe it should be firmer or softer so that you would really Love it, we will work with you to improve your mattress for your comfort and restful sleep. We are dedicated to helping you sleep better on your new iSleep mattress. If after your 100-Night Test Rest, you don’t get the best sleep you have ever had, you may return the mattress for a refund*. That is the iSleep Better Promise. Your new mattress will be shipped and on its way to you within 3-7 days of your order. Depending on the type of delivery service chosen, transportation can add 3 – 10 days. Please note that White Glove deliveries may incur additional delivery time due to scheduling a convenient time for you and additional delivery personnel. Delivery times can also increase when delivering outside of the U.S. due to Customs and additional carriers that are involved. 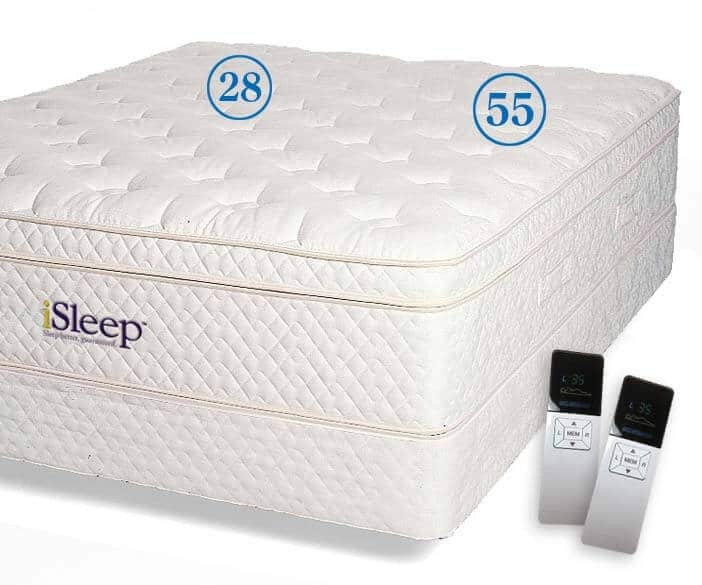 If you are not comfortable with your iSleep mattress at the end of the 100-Night Test Rest period and choose to return the mattress(es), you will only pay return shipping, which can usually be done via FedEx. Foundations, adjustable bases, metal bed frames, temperature control systems, pillows and toppers will work with other mattresses and are not part of the iSleep Better Promise and are non-returnable. These items are covered by our Customer Care Warranty. Packaging materials are available at a charge, home delivery packing materials are removed for your convenience. If you prefer to keep the packing materials after a White Glove Home Delivery, please make arrangements with the delivery service. Returns are promptly processed, and refunds are made within 30 days of receipt of returned mattress. so we can get back to our bed – and there is an audible sigh when we hit the mattress. 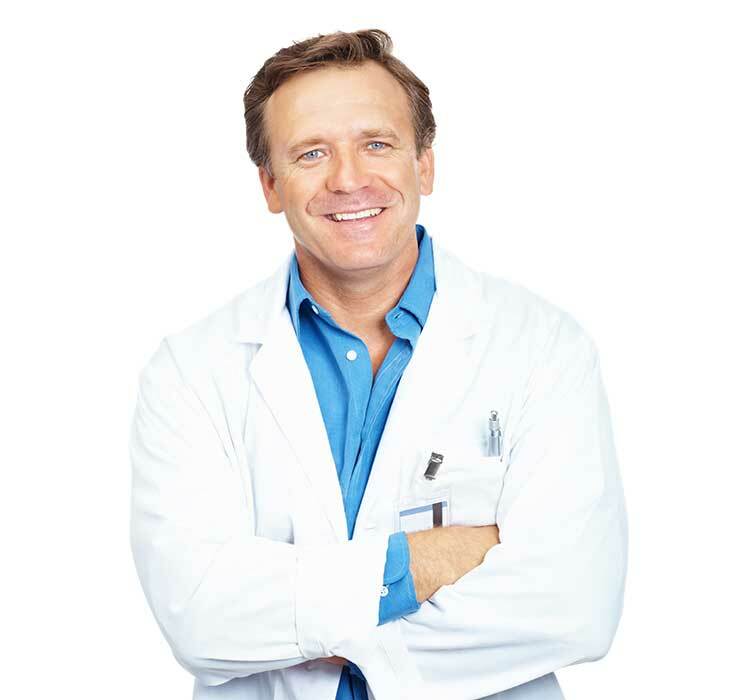 Everything we do is designed to give you the best possible sleep, and that includes all your customer service needs. The Natural Bed Store, inc.
Standard shipping is 3-7 business days after the 24hour processing time. Priority Shipping is 3-4 business days to most locations in the U.S. Shipping times can increase with White Glove Delivery due to scheduling of additional personnel. Shipping times can increase outside of the U.S. because of customs that we can not control.